Recently I finished a winter coat. 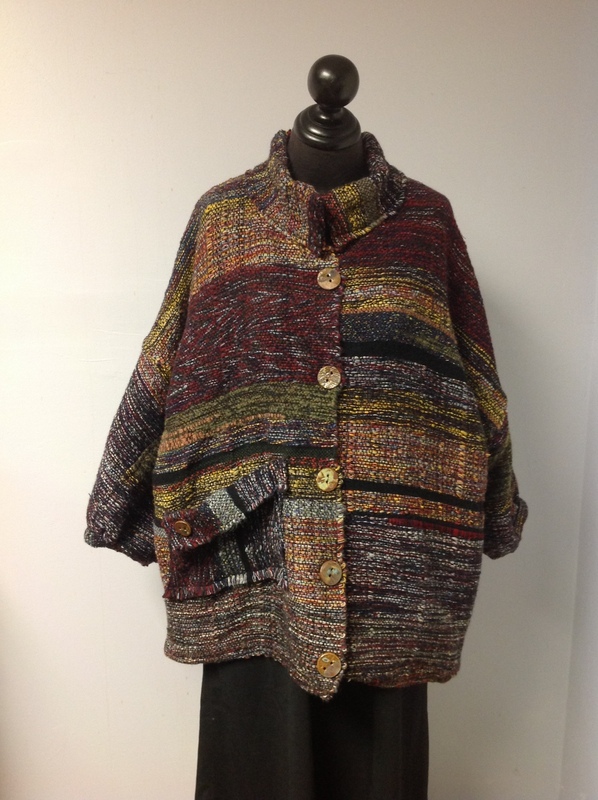 For this coat I created weft by putting 15 strands yarn together. When I got sick of looking at very fine wool yarn on shelves that nobody had been using at the studio, I got an idea to use them somehow. I pulled ends of each yarn and wind on an empty cone by hand. When a yarn run out, I tied the end of new cone. Sometime the color had changed. 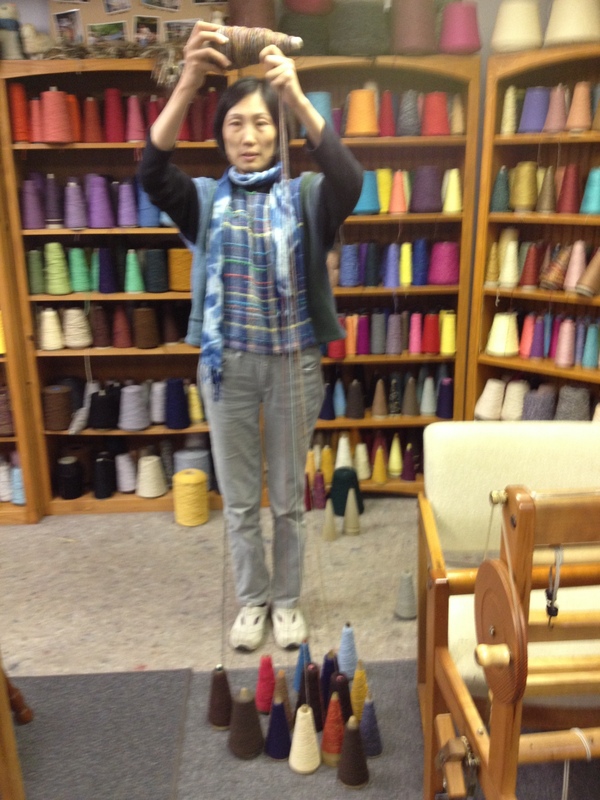 When I wind the yarn on a bobbin ( I used a large shuttle and a long bobbin. ), I cooperated with the twisting technique that Kenzo taught me in this summer. It is a technique that you gave a twist before winding a bobbin by holding yarn in certain angle from the bobbin at the bobbin winder. The pattern shows at the front panel of the coat where red and blue appears on the left. I thought all the colors come together on a black warp. I made it big for sale. The charm point is buttons. They are made by my friend Ingrid Hathaway who is a local potter. I love the combination of those buttons and mulch color coat. The hardest thing is pricing. I usually put the price that my labor is under the minimum rage at a fast food chain store. Oh, well. Someday, I hope to be paid at standard labor range. At least someone gets a warm wool coat that makes me happy! Mihoko, This is wonderful. You are such a talented and innovative weaver and gifted teacher. I wish I lived closer so I could pop in and share in your Nov. Kai. I know everyone will have lots to share and have a great time! Hoorah, Mihoko! The coat is just wonderful. Now that Ready to Hand: SAORI PHiladelphia is open, we are starting to work with Sakiori techniques. Your work is always inspiring!